“No one knows the hour or the day, not even the messengers in heaven, not even the Son. Only the Father knows”. But there are signs and warnings Jesus clearly said we could know. In our time we are observing many things that would indicate that His return is indeed near. Wars and distress, natural disaster and famine, genocide and oppression . Persecution of the church is increasing and as I wrote last year in a post titled “Antichrist” deception by the enemy and his opposition to the true Gospel of Jesus Christ is well underway. Jesus then describes in detail what these signs will be. “Wars, the violent breaking apart of a sinful world, famines and earthquakes are the beginning. The end is still unfolding”. 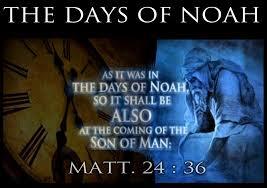 What was it like in the time of Noah? Wickedness is the culture of the day. So much so that evil and the doing of evil is the number one item on everyone’s agenda. Violence is everywhere, the earth is in ruins and God regrets he ever made his crowning creation. The answer to violence, the answer to evil, the answer to ISIS, the answer to sexual sin, the answer to all the gods the world can produce, to evil and wickedness and oppression. Matthew 28:18-19 Even though we can and should observe the events leading up to His return it should not be a cause for fear but rather an urgency to be about His business and the command He gave us “I am here speaking with all the authority of God, who has commanded Me to give you this commission: Go out and make disciples in all the nations”. Ephesians 1:9-10 He has enlightened us to the great mystery at the center of His will. With immense pleasure, He laid out His intentions through Jesus, a plan that will climax when the time is right as He returns to create order and unity—both in heaven and on earth—when all things are brought together under the Anointed’s royal rule. He will come but there is work to do while we wait! Thanks for your blog ministry and for the encouragement you offer all of us. Your stressing that we have urgent work to do by making disciples before Christ’s soon Second Coming is so important. Also, we need to remember to pray for one another. God bless. Thank you so much for taking the time to offer encouragement to me and for reading my blog. I believe the one hope for all mankind is the saving grace Jesus came to provide for all of us. It is the only way people will turn from hate and destruction and evil. Thank you again Betsy!